Everyone has a list of those places that they've never gotten around to visiting. These are the sights and scenery often located close to home, which you've inexplicably never quite managed to take the time to see without really thinking much about it. Chincoteague was one of those places for me, a small beachtown community on the eastern shore of Virginia that I had somehow never visited before Liz and I went there for a holiday weekend in 2018. 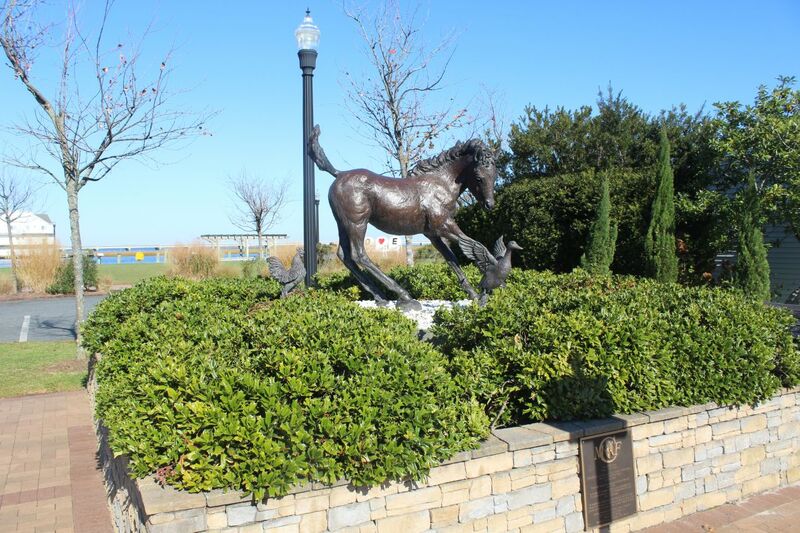 Chicoteague is famous for the wild ponies that live in a wildlife refuge on neighboring Assateague Island, and the town is a popular summertime resort for families visiting the Atlantic shore. 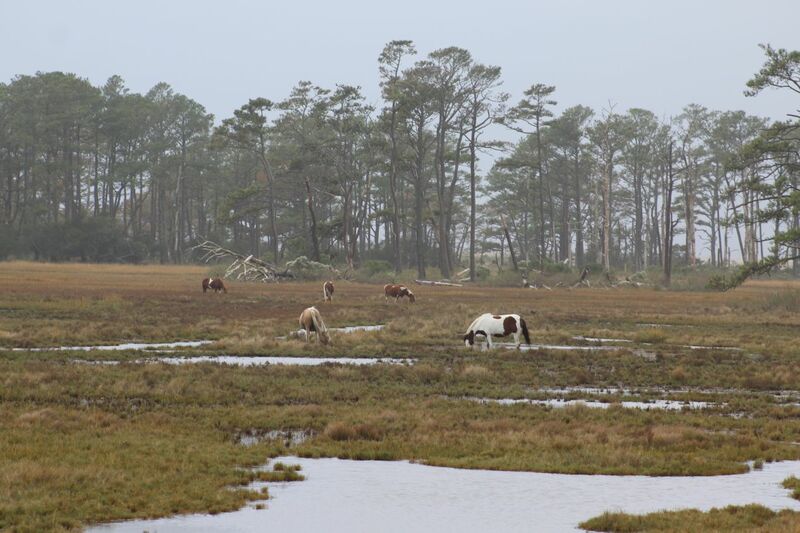 Each year, the ponies are driven in a swim across the narrow channel of water separating Assateague from Chincoteague as part of a big celebration known as Pony Penning Day. This attracts thousands of visitors every year and serves as the highlight of the summer season. 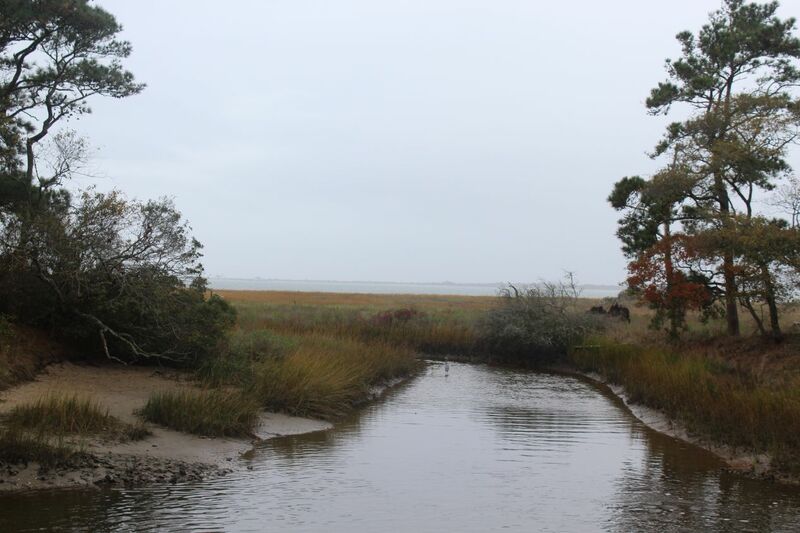 We were visiting Chincoteague out of season in November, in the hopes of relaxing and taking it easy at a time when we'd be escaping the summertime crowds. 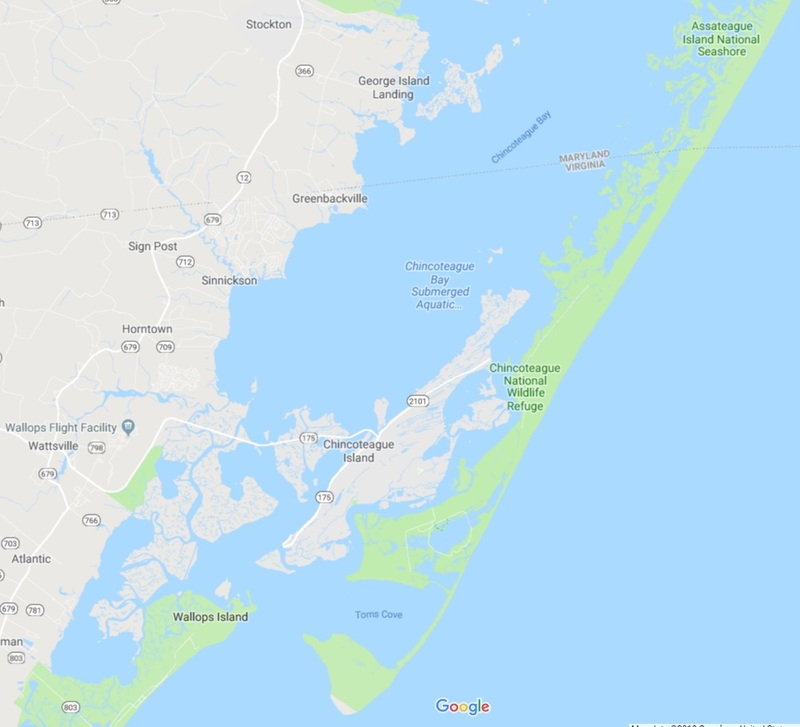 The town of Chincoteague is located on an island (unsurprisingly named Chincoteague Island) about three hours of driving away from our home in the Washington DC suburbs. 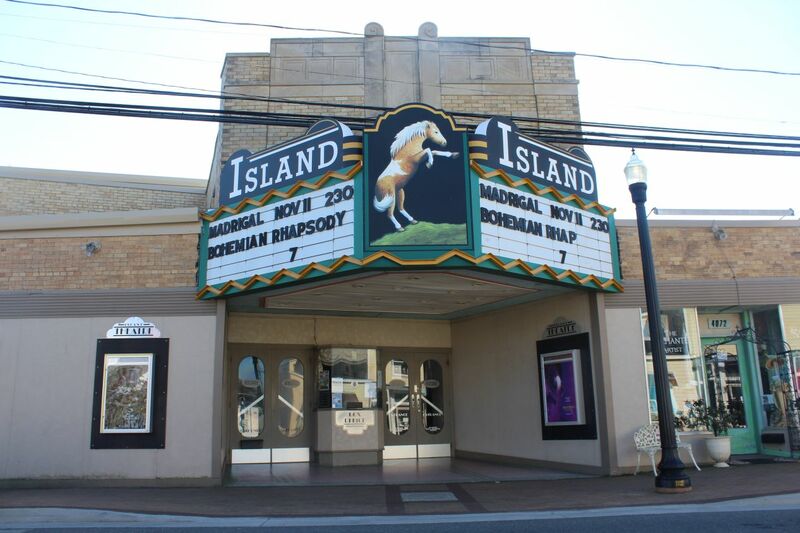 I had taken the trip from Baltimore to Ocean City, Maryland innumerable times growing up; my grandparents owned a trailer in Bethany Beach, Delaware and our family would head down to the ocean several times each year to stay there for a few days. My aunt later purchased a condo in Ocean City itself, which I was also able to visit on many trips over the years. As a result, I knew the local sights of Ocean City quite well, everything from the best miniature golf courses (a toss up between Old Pro and Jolly Roger) to the pros and cons of the local chain stores: Sunsations, Candy Kitchen, Dumser's Dairyland, and Grotto Pizza to name a few. But for whatever reason, I had never taken the half hour detour south at Salisbury and went to visit Chincoteague instead. 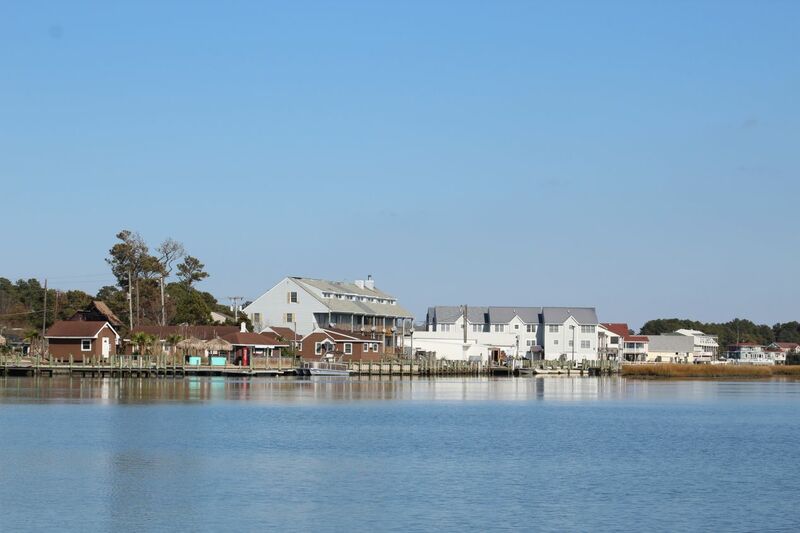 Chincoteague is a much smaller town with only about 3000 year-round residents, and it has retained more of an old fashioned small town feeling as compared to the big summer vacation destinations to the north (Ocean City) and the south (Virginia Beach). 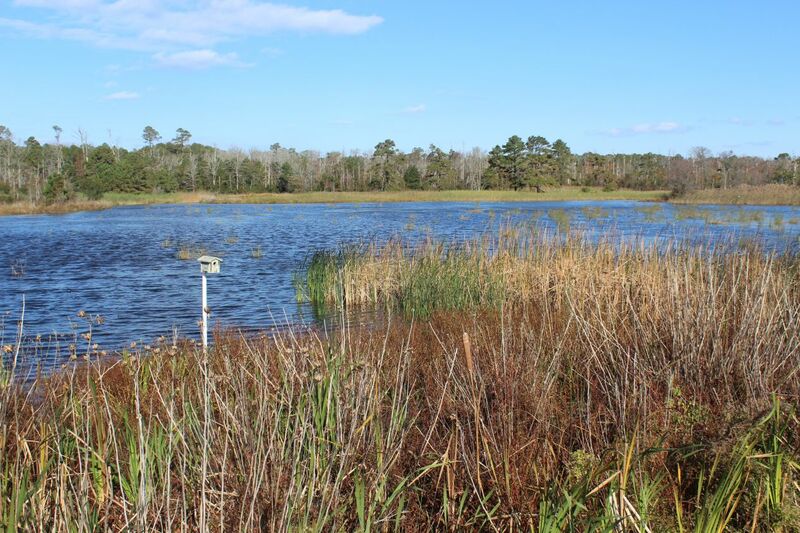 This is almost certainly due to the fact that the Atlantic coastline on Assateague Island is a protected wildlife area, one where development is not allowed. It's help to preserve this area and keep it from becoming too commercialized. We arrived in the late afternoon on a Friday at the start of an extended Veterans Day weekend. 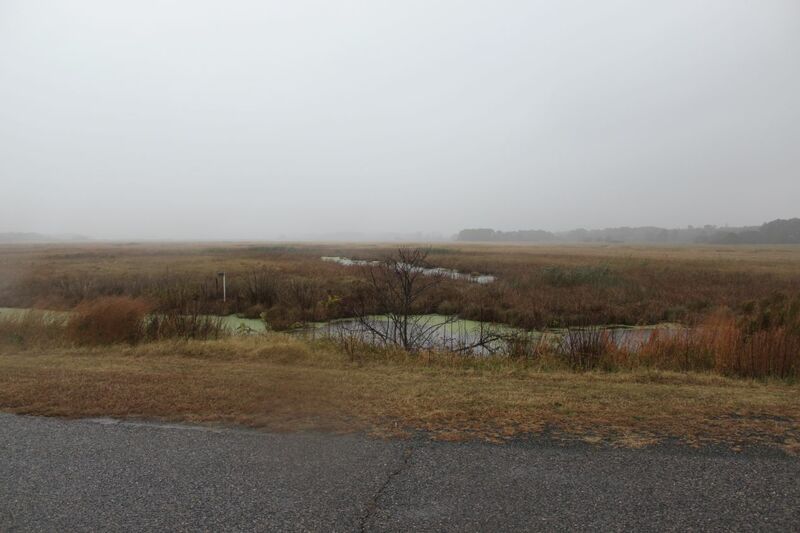 After checking into our hotel we drove across the bridge from Chincoteague to Assateague, officially entering the confusingly-named Chicoteague National Wildlife Refuge (which is located on Assateague Island). 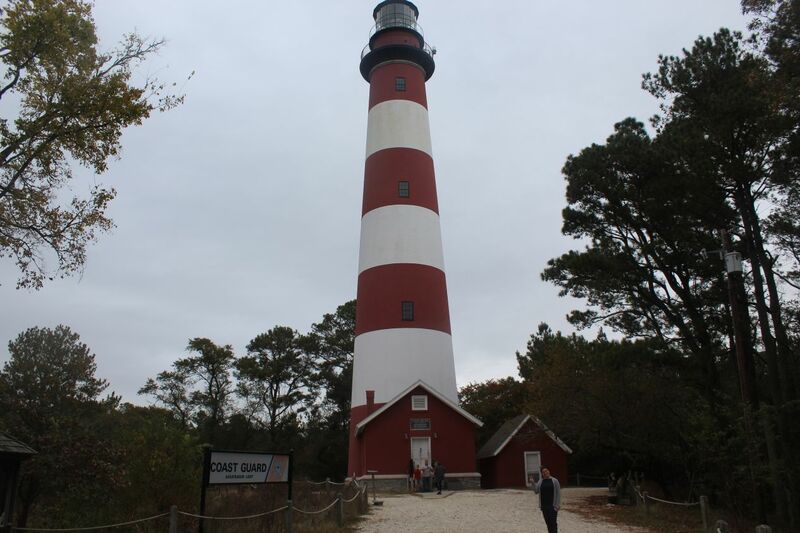 The first object that drew our attention was the Assateague Lighthouse, with its barbershop-striped coloring making it easily recognizable for miles in every direction. It was constructed in the 1860s to help ships navigate around the shallow waters that mark the entrance to Chicoteague Bay. We wondered why the lighthouse was built at such a good distance from the ocean, only to find out later on our visit that the landscape itself had shifted over the past 150 years. 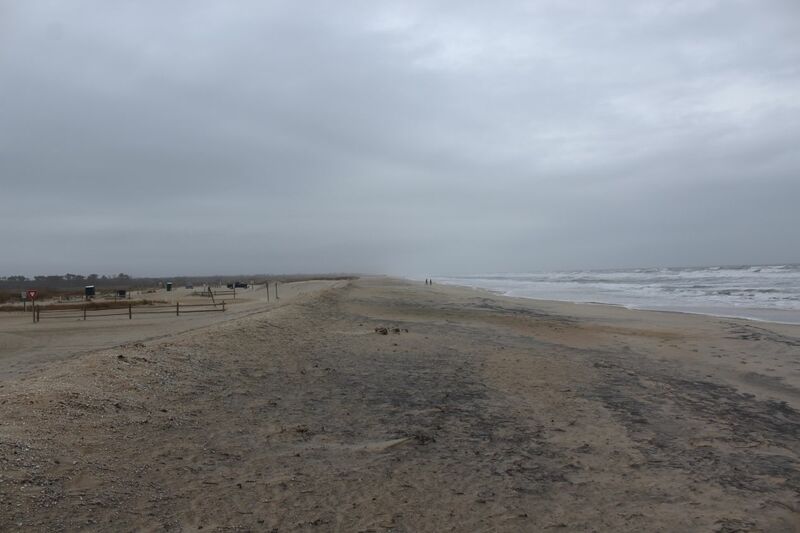 Assateague is a barrier island that lacks much in the way of permanence, and the water line had moved away from the lighthouse in the century and a half since its construction. 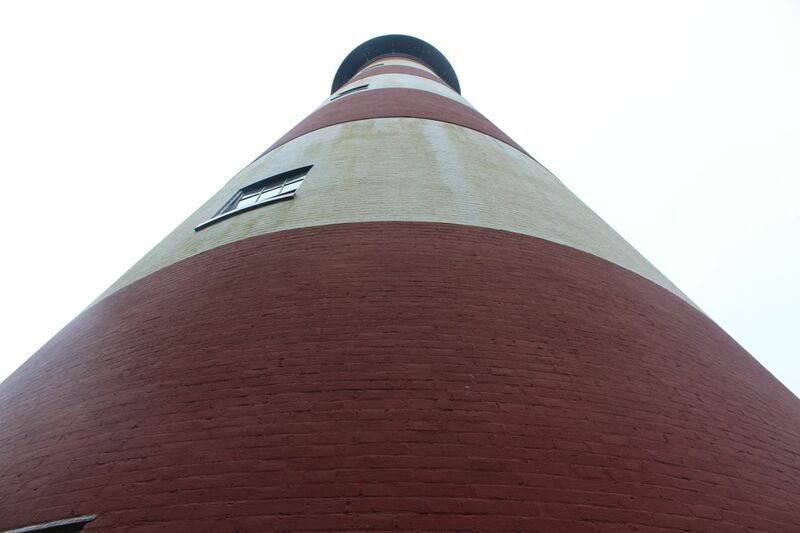 Visitors can climb up to the top of the lighthouse for panoramic views of the area, but unfortunately it was already closed for the day when we arrived. It was a rather dreary afternoon at the time, cloudy and with light rain occasionally falling - not the best weather for sightseeing. 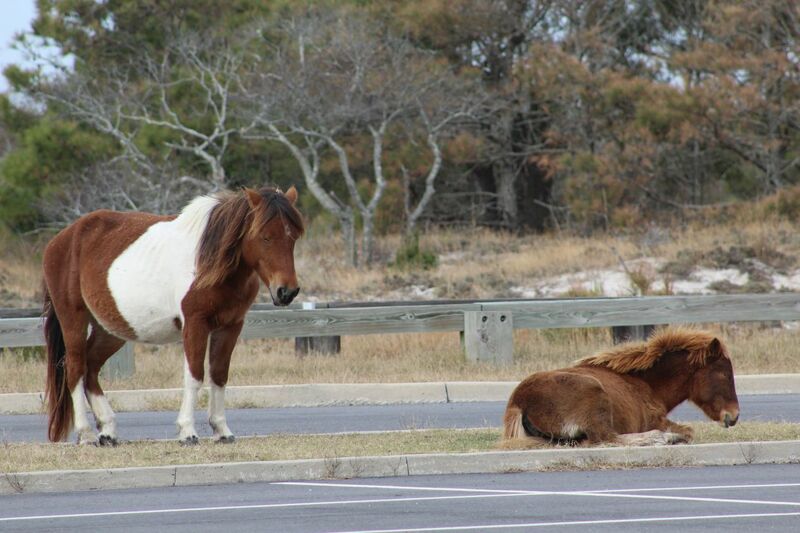 The big attraction on Assateague Island is naturally the wild ponies. 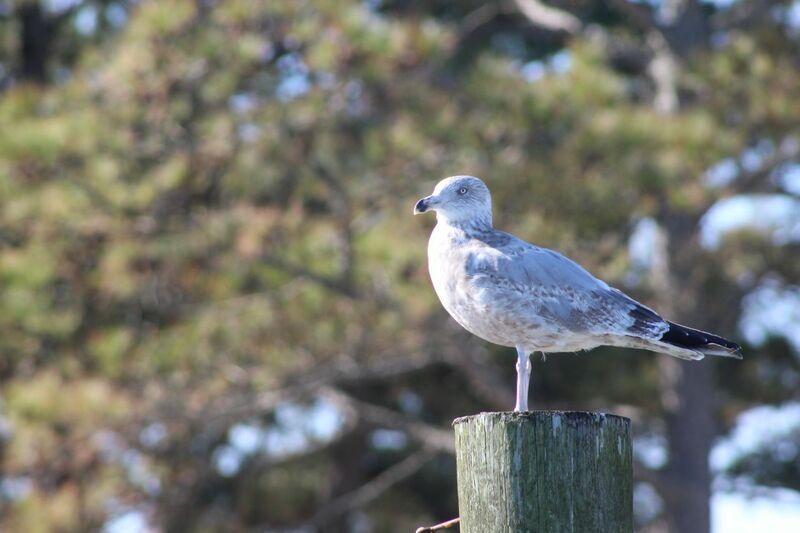 They roam up and down the length of the barrier island, which is only a mile or two in width but runs all the way up past the Maryland border to the north, a distance of about 30 miles / 50 kilometers. 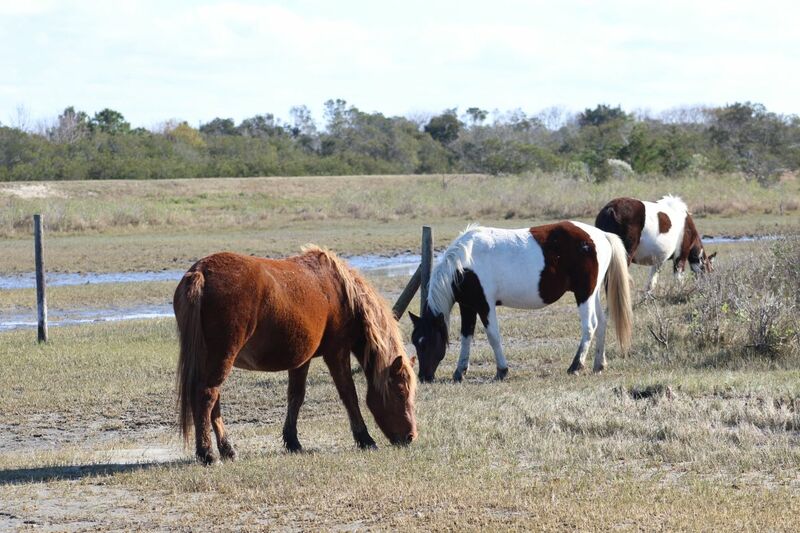 The ponies are little rugged animals that live off of the grasses growing in the salt marshes that dot the island. They have no predators to worry about and live a rather idyllic lifestyle in their protected wilderness. We spotted a small herd almost immediately from the main road running through the park, chomping away on the grasses in the marsh a little ways off in the distance. There was a steady rain falling but the ponies didn't seem to mind. The wetlands environment here was quite unique, a meeting ground of land and water that wasn't entirely one or the other. It wasn't the sort of place where I would have expected to find horses living in the wild. 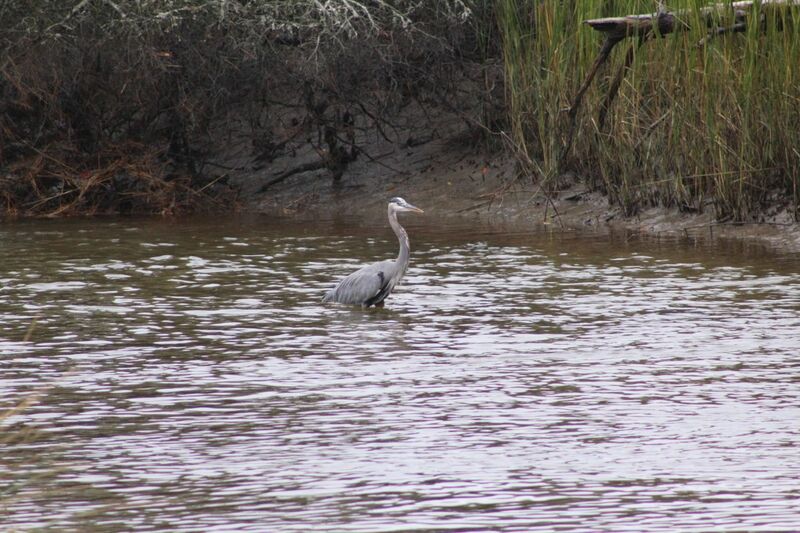 There were other animals to be seen on Assateague in addition to the ponies. 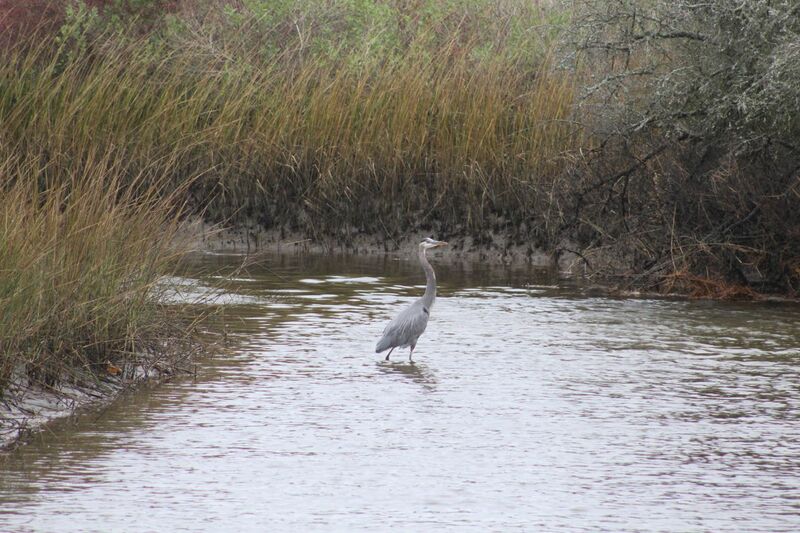 We had the good fortune to spot this blue heron wading through the reeds off to the side of the road, and stopped to take some pictures. 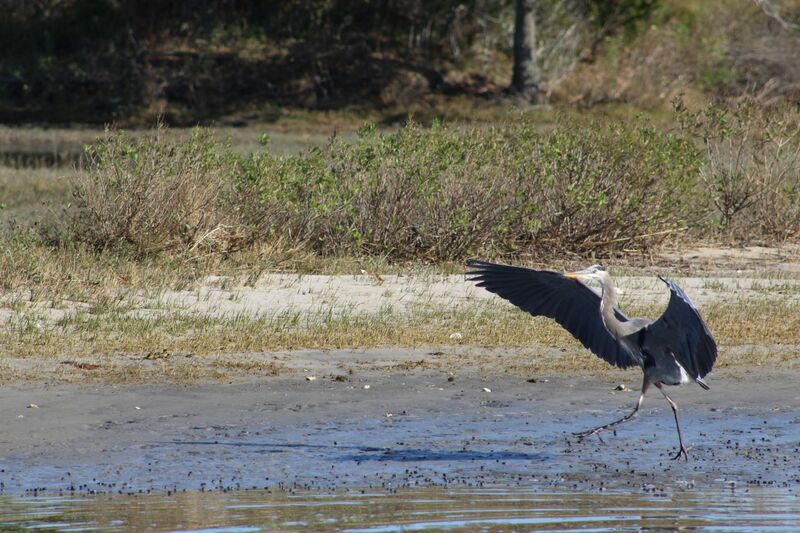 The blue heron has become a symbol associated with the preservation of the Chesapeake Bay, and there's no denying the regal elegance of this bird as it struts about on its long legs. (I've had a particular fondness for herons thanks to their use as the symbol of a blademaster in the Wheel of Time book series.) We know now that modern day birds are the surviving form of dinosaurs - not descended from dinosaurs but literally dinosaurs themselves - and birds like herons make this relationship easy to see. Remove the feathers and this would be a small fish-eating dinosaur. 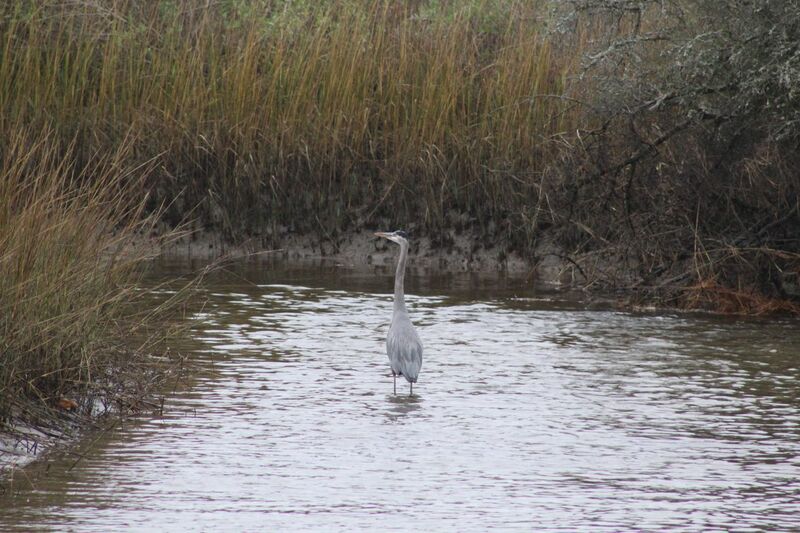 It wouldn't look nearly as pretty without that gray and blue plumage though. The park road led eventually to a beach on the Atlantic coast. In the summer months, this place would be packed with tourists sunbathing on the dunes and kids playing out in the waves. Visiting in November was a very different story; aside from a scattering of other visitors here and there, the beach was deserted. Underneath a leaden sky heavy with rain, the beach had a wild, almost primal look to it. The wind was whipping up a storm and tossing our hair around (a bigger problem for Liz than me! ), while the waves rolled in to crash down with their cold waters in endless succession. It was not a day where anyone would want to spend much time outdoors in these elements, and we didn't stay here for long. It was starting to get dark, and we decided that we would go for a quick drive around Snow Goose Pond on something known as the Wildlife Loop before calling it a night. The earlier light rain had turned into a steady downpour by now, and visibility was dropping along with the rainfall. We couldn't see too far into the distance before a gloomy haze settled over everything, making it nearly impossible to spot more in the way of wildlife. Our camera does a great job of taking photos in low light conditions, and therefore these pictures make it seem much brighter than it actually was at the time. Brackish wetlands stretched out in every direction from the Wildlife Loop road, running off towards the seashore that was located less than a mile away. It quickly become apparent that we weren't going to see anything else tonight, and we made the short drive back into town again. Just taking these few pictures had gotten me pretty soaked when I stepped outside of the car. It rained so hard this evening that the parking lot was half flooded at the brewery that we went to visit. Fortunately this was the offseason and there was no trouble finding a place to park that wasn't underwater from the downpour. The next morning dawned bright and clear, with the poor weather having departed along with the night. 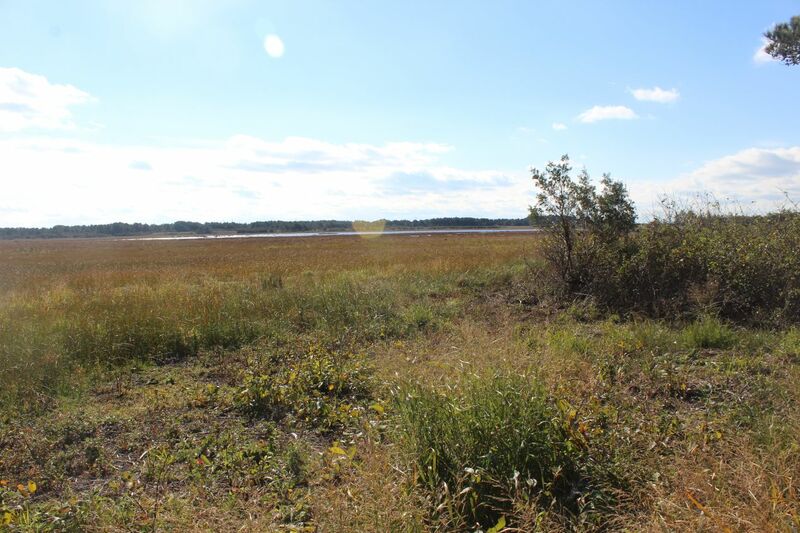 We decided to head back to Snow Goose Pond and spent an hour on the walking trail there, labeled as the Marsh Trail for obvious reasons. Out on the walking path, the air was crisp with the ongoing arrival of autumn, and the sky was almost shockingly bright and clear. What a contrast to the previous day's weather. These pictures were taken in the exact same area that we had visited the night before, only this time we were walking under sunny blue skies instead of a low ceiling of unrelieved gray clouds. 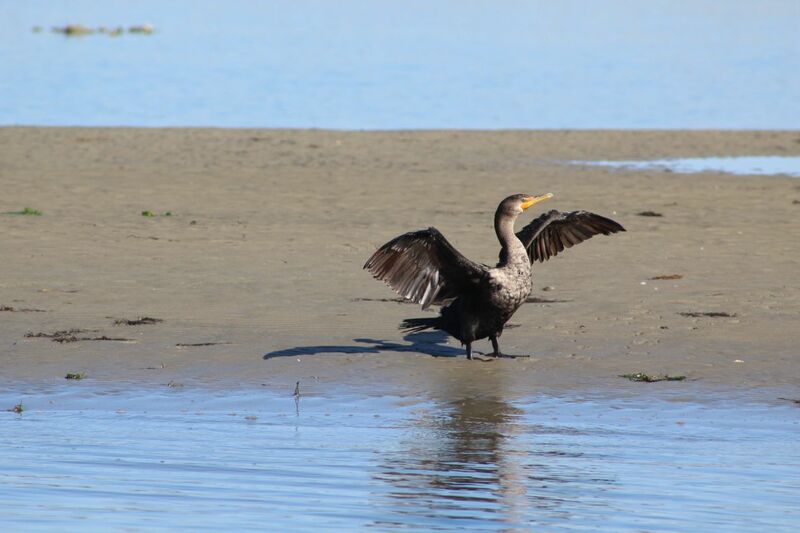 The wetlands were showing their best side on this morning after previously hinting at some of their worst. 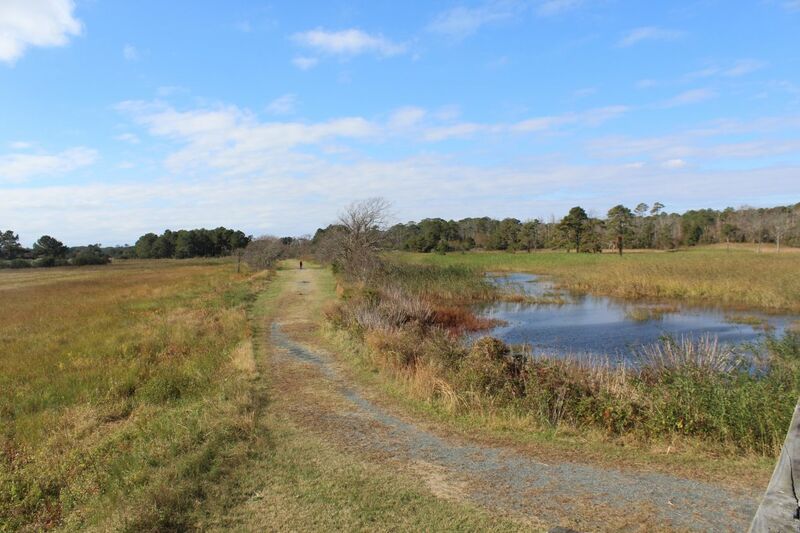 The Marsh Trail ran for about a mile, snaking its way through the grasses of the tidewater swamps. There was water everywhere on both sides of the path, and I was sure that the trail would have soon sunk into the marshes as well if it wasn't regularly maintained by the park service. We didn't see any more of the wild ponies on this walk, but there were large numbers of birds off in the distance. 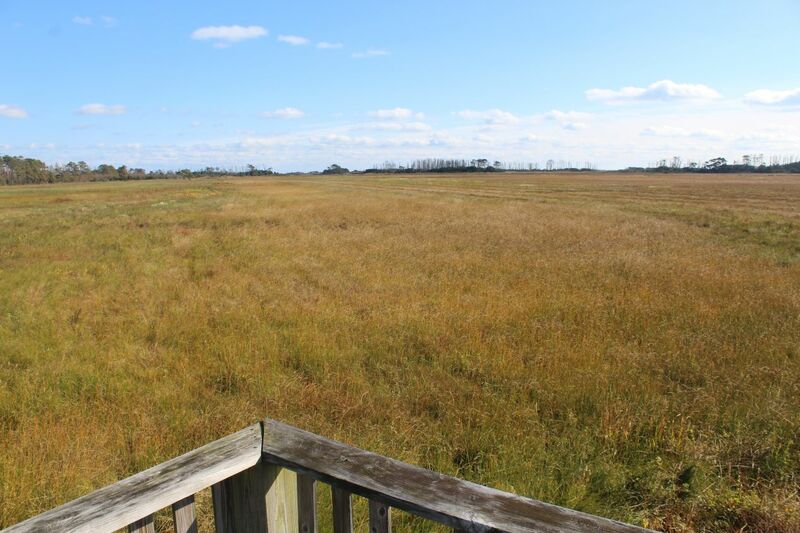 At about the halfway point of the trail, a viewing platform had been constructed out of wood that looked out over the sea of grass. 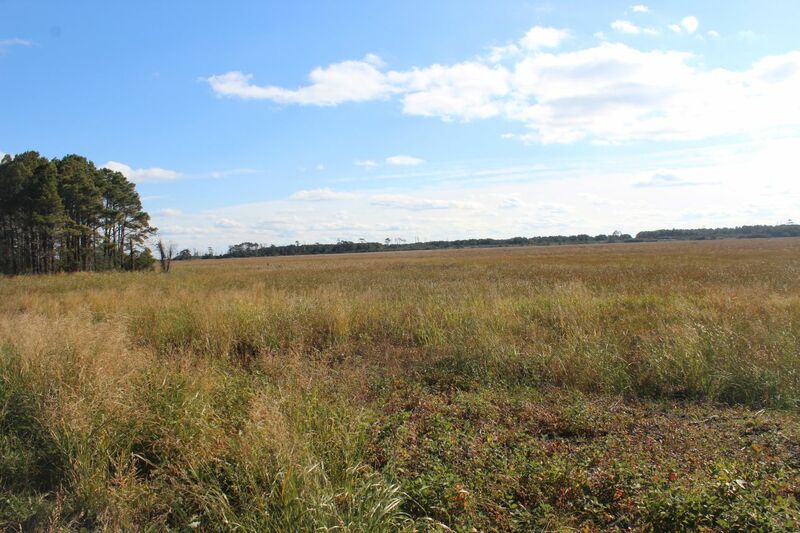 It was almost reminiscent of the Great Plains in a sense, with the tall grasses stretching out towards the horizon, except of course for all of the water that those grasses were growing out of. 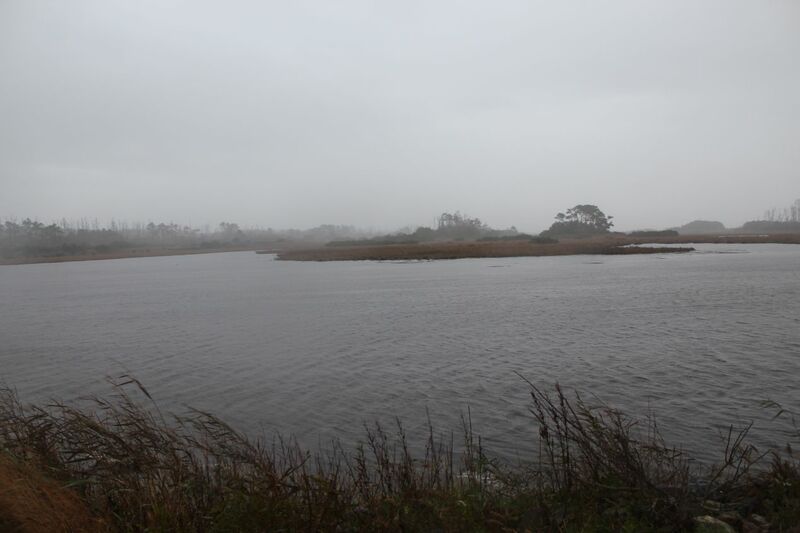 The ecosystem on these barrier islands is supposed to be unique, not present anywhere else away from the coastline. It was a beautiful sight to behold on this morning, and we were glad that we'd taken the time to do this walk. We spent the rest of Saturday visiting friends in Cambridge, Maryland who owned a house in that area, then returned back to Chincoteague late that night. 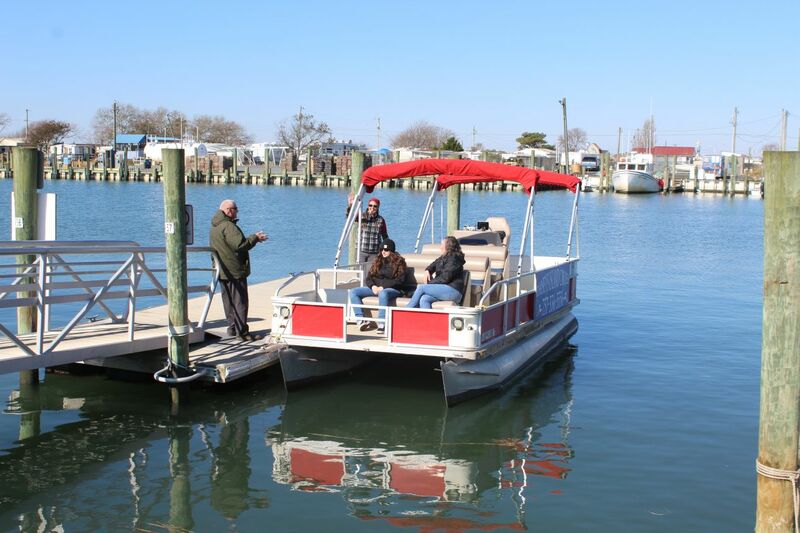 For Sunday, we had a boat tour booked with a local company which would take us around Chincoteague Island and hopefully spot some more of the wildlife in the region. 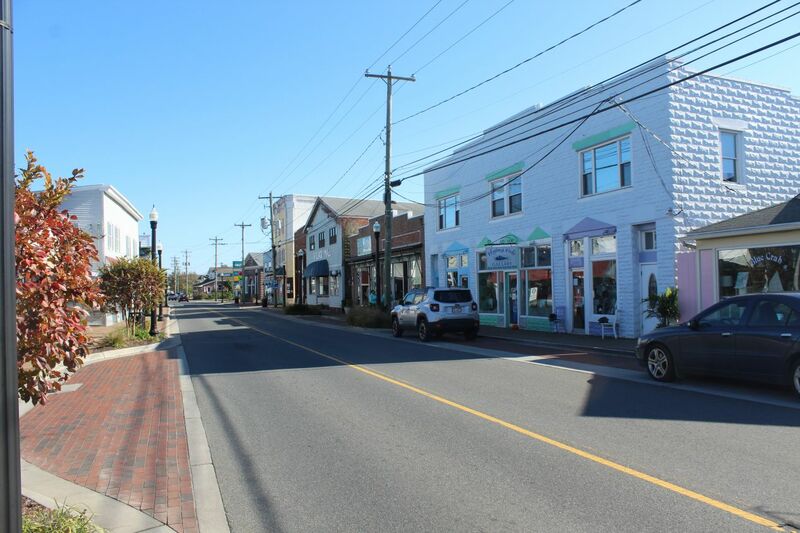 Before heading off to the boat tour, we spent an hour or two wandering around the town of Chincoteague itself. It was a lazy Sunday morning and many of the stores were closed, especially with this being the offseason for the beach town. 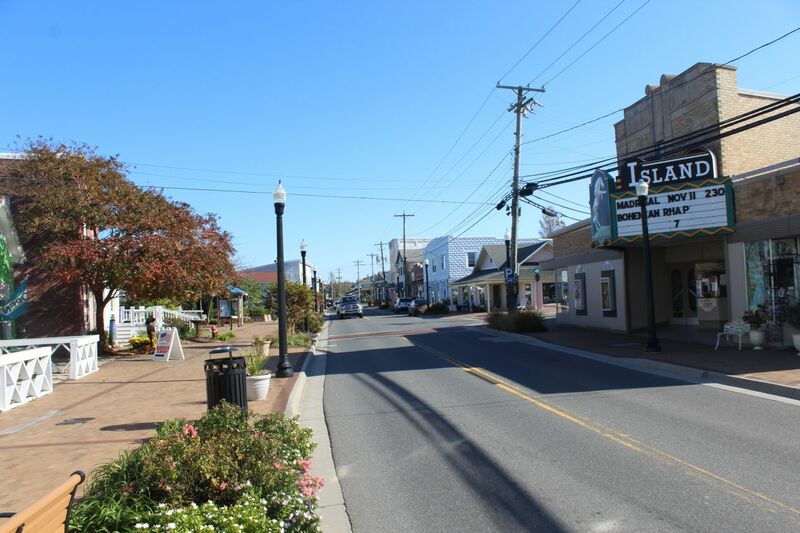 Chincoteague is quite small overall, with most of the business located along the Main Street pictured here or Maddox Boulevard that runs east towards Assateague Island. It was a charming place to visit, with its own theatre, several restaurants, and lots of little boutique stores. 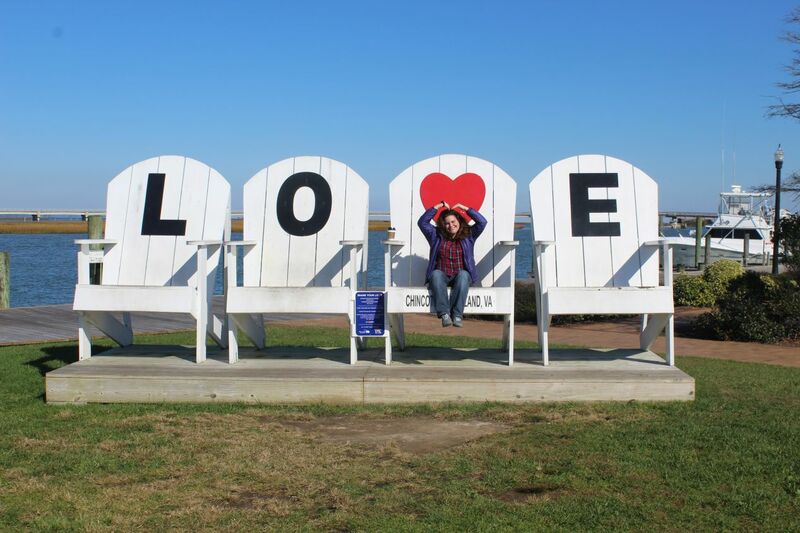 There's a fair amount of the cheap tourist dives that always pop up in any beach town, but those places were closed for the winter when we visited, and it was clear that Chincoteague still retained most of its original identity. There were no big high rise condominiums to be found here, and few national chains of any kind outside of one McDonalds. The overwhelming claim to fame for Chincoteague comes from the children's book Misty of Chincoteague, written by Marguerite Henry in 1947. It tells the story of two children and their efforts to raise a filly (Misty) born to a wild horse, with the whole story set in Chicoteague against the backdrop of the Pony Penning Day festivities. I had always thought that this story was pure fiction, but apparently Misty was an actual horse purchased by Marguerite Henry, albeit one that was born in captivity and not in the wild on Assateague. 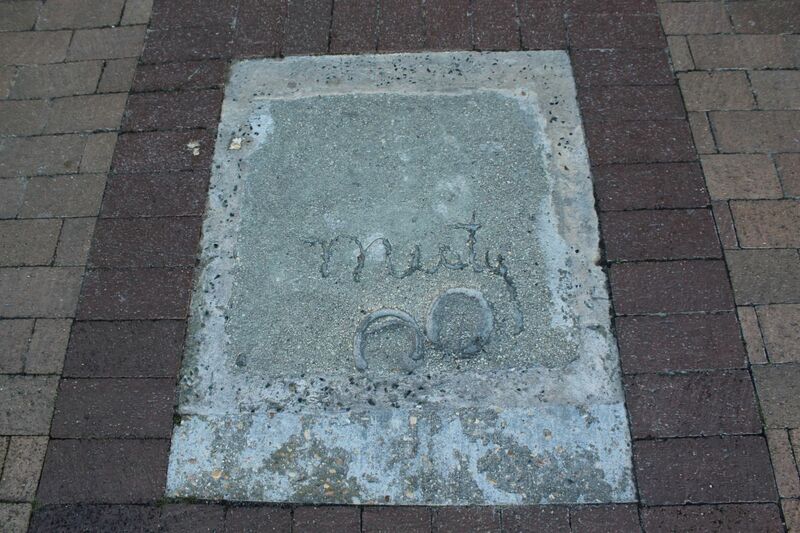 The Misty of Chincoteague books are treasured in Chincoteague by the townspeople, with a lifesized statue of Misty in the town square, and hoofprints from Misty forever captured in cement outside the theatre. There was a fantastic independent bookstore named Sundial Books in the center of the town when we visited, and I highly recommend spending some time there for anyone who might visit. The featured books on display there included, of course, a big section on Misty of Chincoteague. 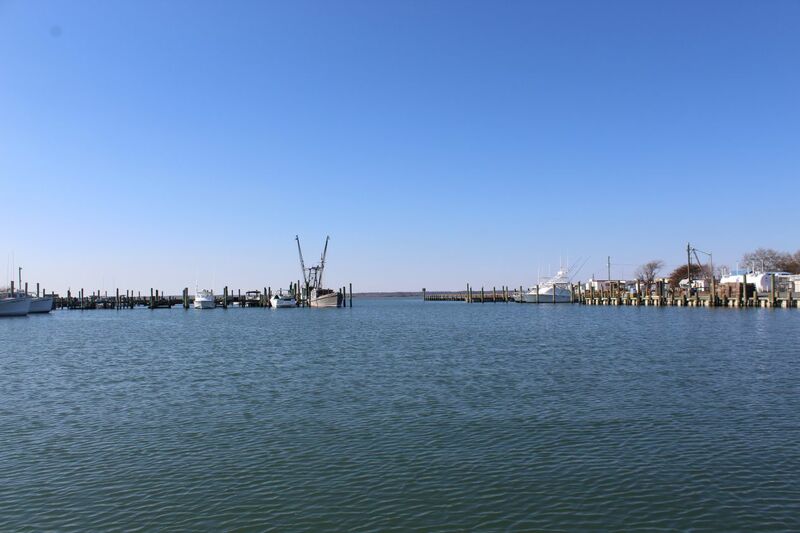 After finishing up in the center of town, we took the short drive down to the southern end of Chincoteague Island where a small marina was situated. This was where the touring boats depart for scenic trips around the island, albeit on a much smaller scale than the cruise ships found in other tourist destinations. Our trip for the afternoon was run by Daisey's Island Cruises and took place in the little six-seater boat with the red canopy on top. Somewhat surprisingly the small capacity of the boat was full on this trip, and the tour guide operator explained that they run the cruises throughout the year and normally fill them up on the weekends. It didn't take long before everyone was present and our group was taxiing out of the marina and into the waters of Tom's Cove. 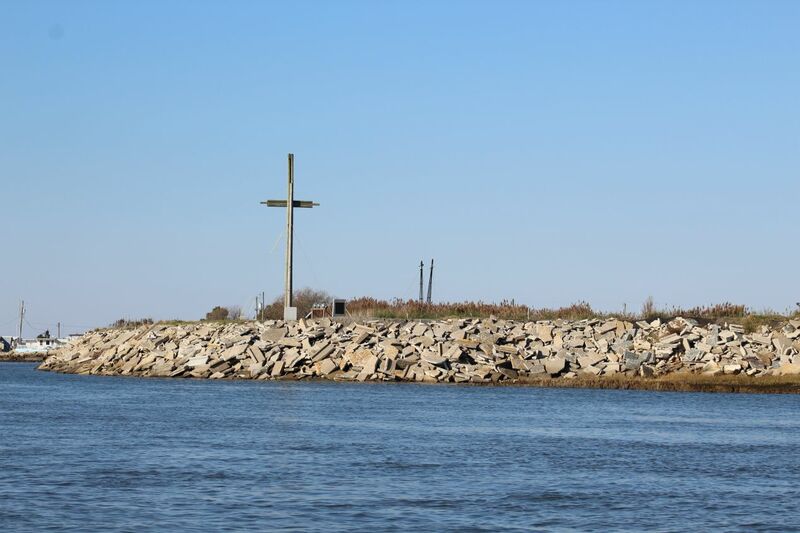 We passed a nearby wooden cross on the shore, the Chincoteague Island Watermen's Memorial, a tribute to those who had been lost out on the waters over the years. It turned out to be quite cold on the boat once the craft reached its full speed, and we bundled up underneath blankets that the tour had thankfully provided. We encountered good luck on wildlife sightings almost immediately, with the dorsal fin of a dolphin appearing in Tom's Cove. 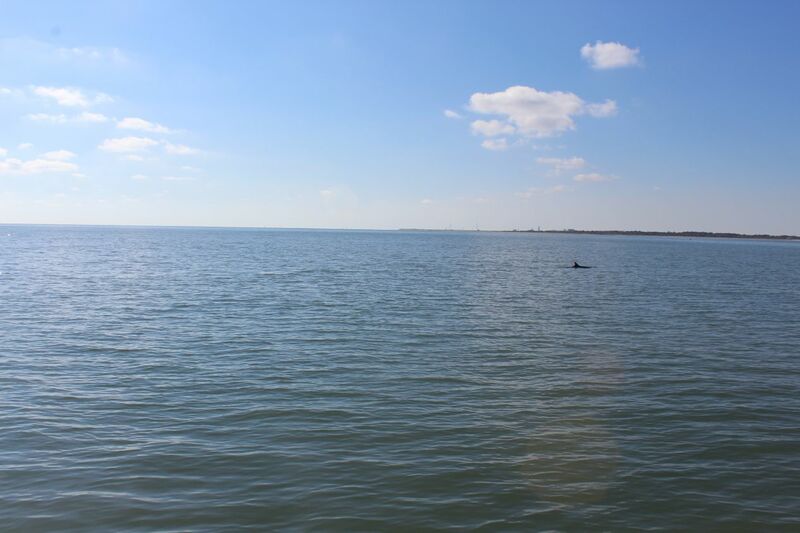 The Virginia coast is indeed within the habitat range of dolphins, as they can be spotted anywhere from roughly New York City down to Buenos Aires along with everything in between. With that said, dolphins are somewhat uncommon to see in the winter months and we were pretty fortunate to spot this one. This was the first time that I'd seen a dolphin in the wild! 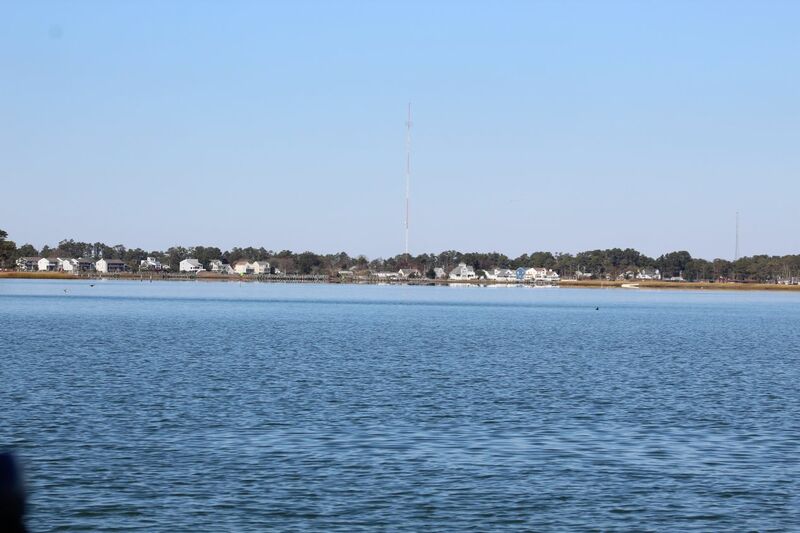 Our tour guide steered the boat around the southern edge of Chincoteague Island and then up into the narrow channel of water that separated Chincoteague from Assateague. 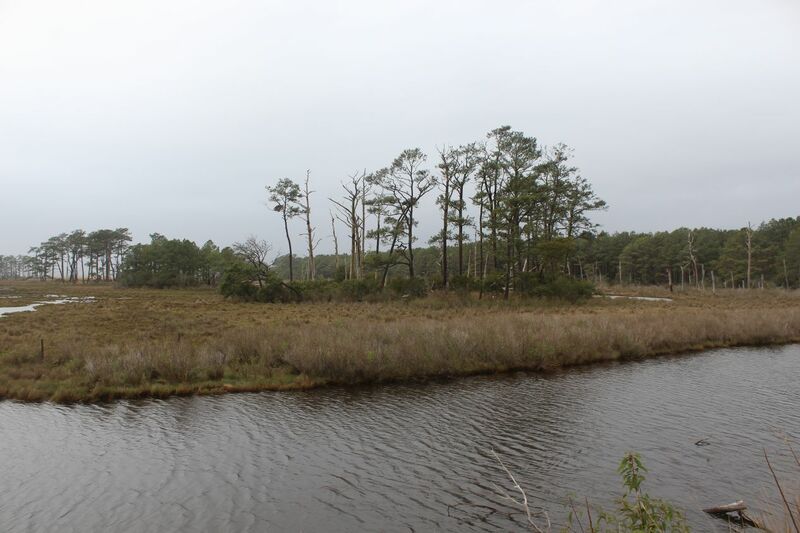 This was a passage that offered great views to both sides, with the picturesque town of Chincoteague off to our west and the wildlife reserve of Assateague off to our right. 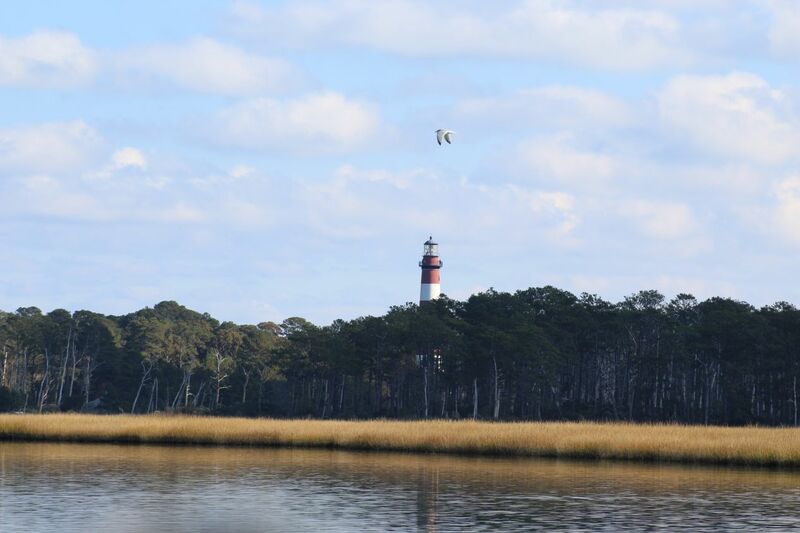 The lighthouse that we had visited earlier was easy to see from the water, the red and white color of its tower poking up above the trees to the east. 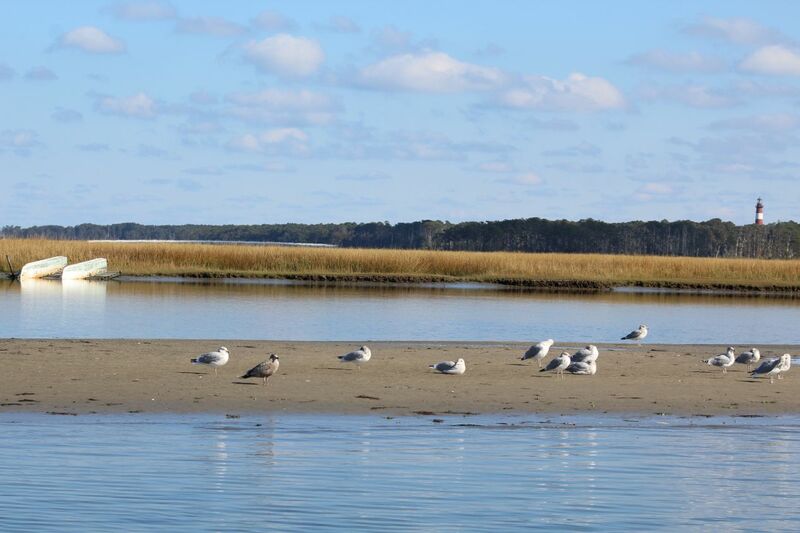 We also came across lots of seabirds on this waterway, flying above the boat or taking a few minutes to relax on a sandbar exposed at low tide. I don't know enough about birds to identify the different species on display here; we came across several different types with distinct plumage. As we continued to head north, we passed the location where the Pony Swim takes place each year. Our tour guide explained that stands are set up each year on the shoreline, and the top spots to watch the ponies on their swim can sell for several hundred dollars. 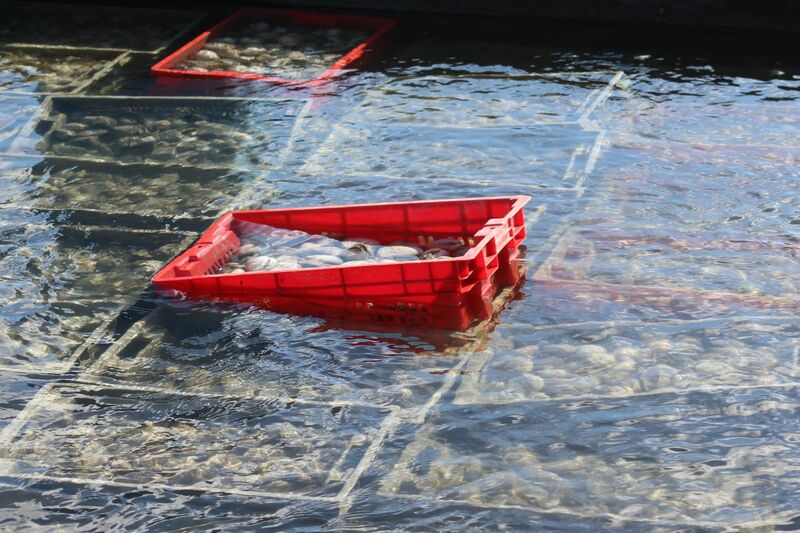 We also came across a waterman who was working to bring up clams and oysters from the bottom of the waterway. 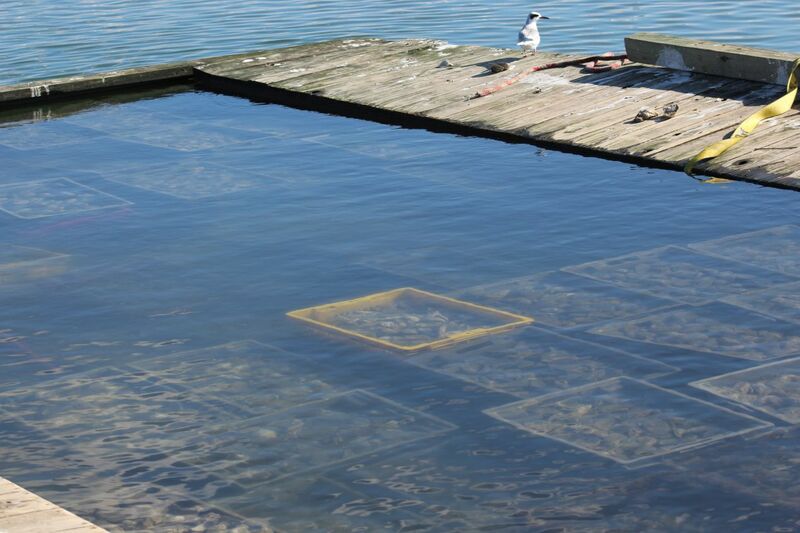 (I can't recall specifically if these were clams or oysters; both are harvested in the area.) 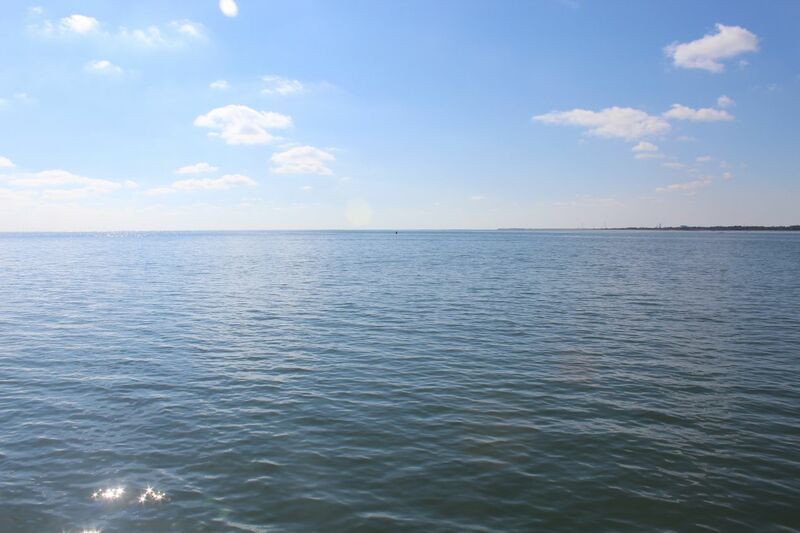 The whole Chesapeake Bay region is known for its excellent seafood, and the restaurants in Chincoteague all advertised their freshly caught crabs, clams, and oysters. This was a tough job and I didn't envy the waterman in his work. If there was any consolation, this was an absoulutely beautiful day to be outside despite the chilly weather, and some of the wildlife created natural tableaus for pictures like the bird flying in front of the lighthouse above. 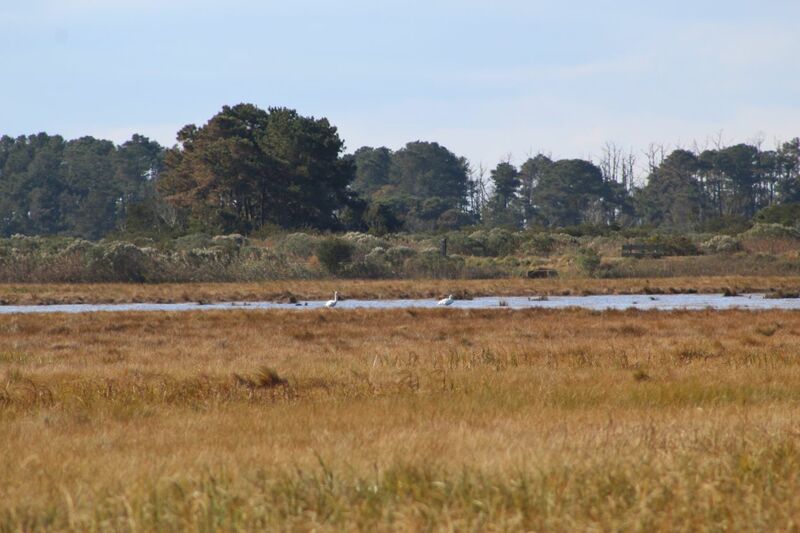 Birds were nice and all that, but the main reason why tourists take a boat trip at Chincoteague is to see the wild ponies on Assateague. 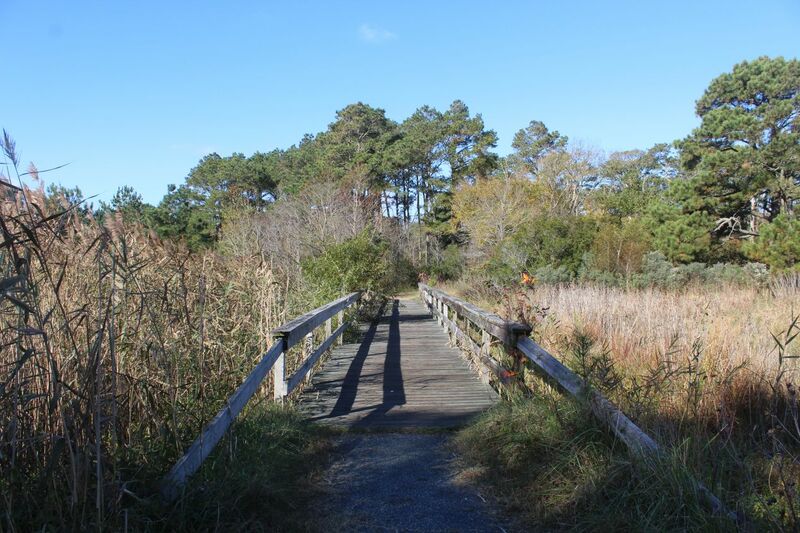 We had to travel a fair distance to the north, underneath the road bridge that connects Chincoteague to Assateague, before eventually finding one of the herds near the entrance to Janey's Creek. 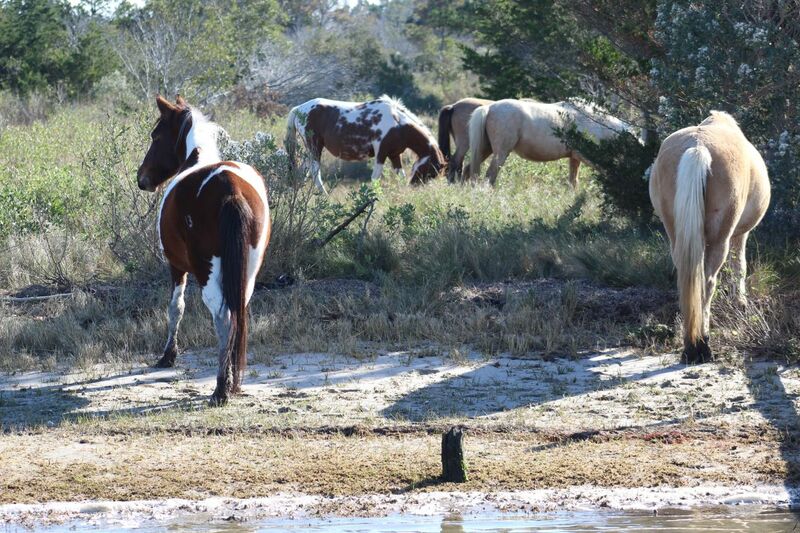 There were roughly a dozen ponies traveling together here, sedately munching on the grasses that grow near the water's edge of the barrier island. 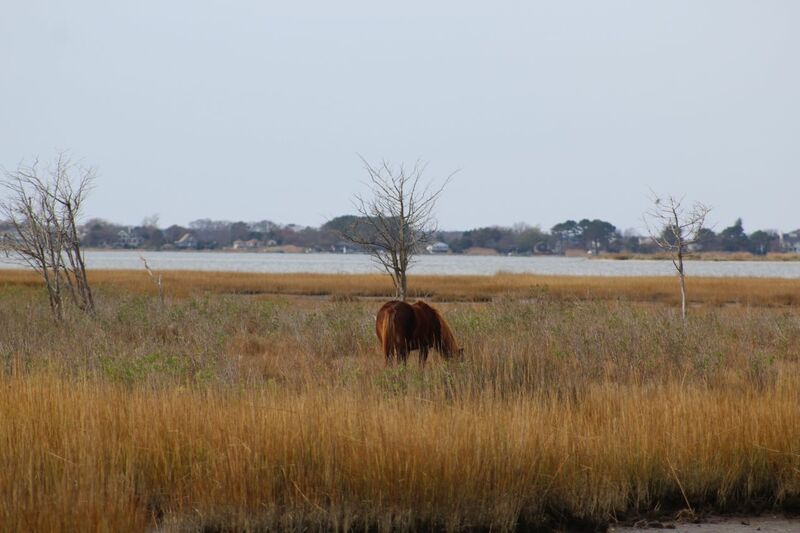 The Chincoteague Pony is its own distinct breed of horse, with their limited range and tough diet of salt marsh plants combining to limit them to a height of only 13 hands on average (4.5 feet or 1.35 meters). 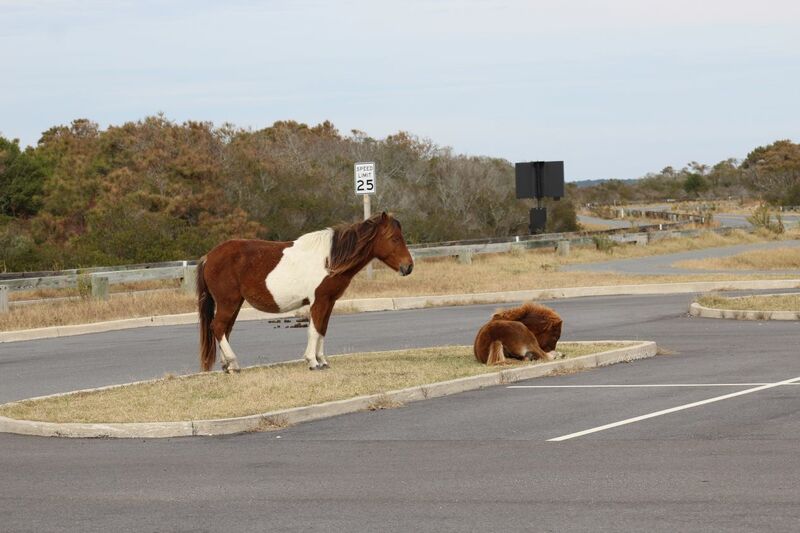 Everyone refers to these animals as ponies but they are actually wild horses, stunted in size due to the climate conditions on Assateague. In practical terms, the ponies are adorably cute and it's easy to see why they've been so popular for generations of visitors. 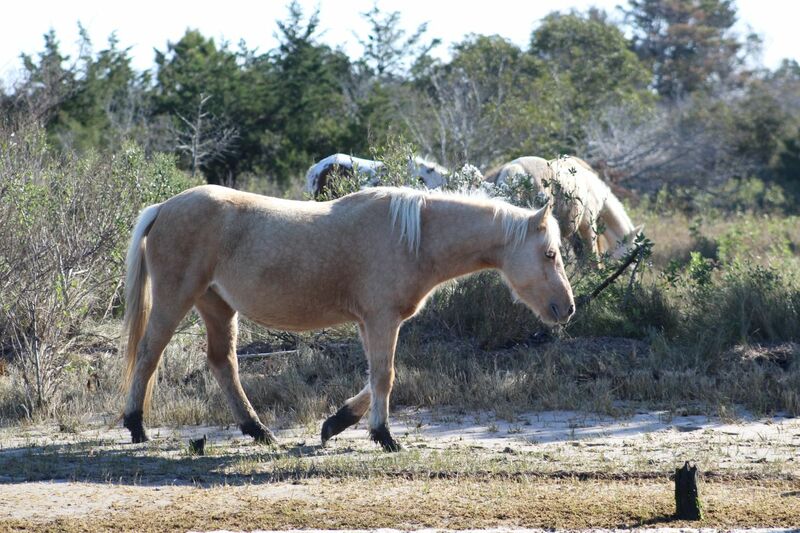 The population of the ponies on Assateague is tightly controlled and limited to 300 in total. This is the purpose behind the Pony Swim and the Pony Penning Day celebration (aside from raising money for the island via tourism), the need to control the population of the wild horses to stop them from overbreeding and then starving to death. 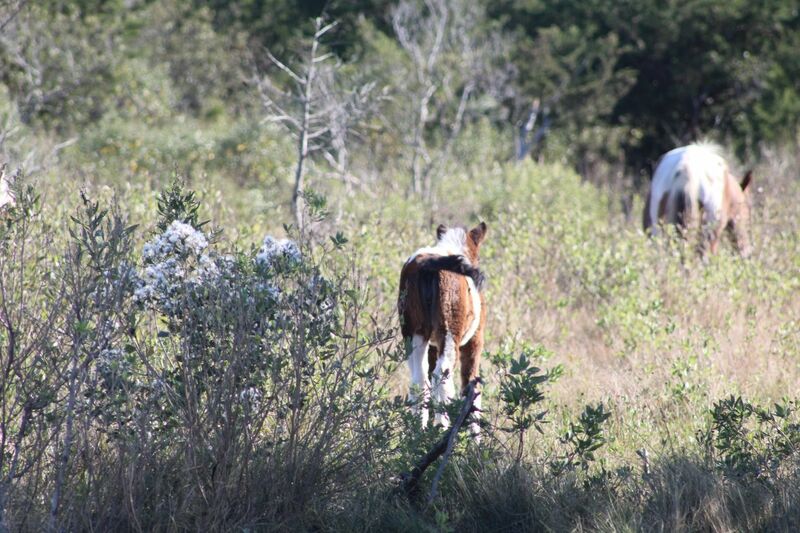 Every pony on Assateague is rounded up and swum across to Chicoteague, with most of the newly born animals auctioned off to bidders, thereby maintaining the population at 300. The first Pony Penning took place in 1835 and it has been an annual festival in Chicoteague since 1885. Every pony is named and tracked, with pony enthusiasts able to "adopt" one of the wild animals and donate money towards making sure that they are kept up to date on vaccinations and the like. This small herd had a foal with it, the little horse awkward and gangly in the way that young horses always are. It was too bad that we didn't get a better picture of the little guy. While we were watching the ponies, a blue heron flew into the picture and landed at the water's edge, spreading its wings wide in the process. 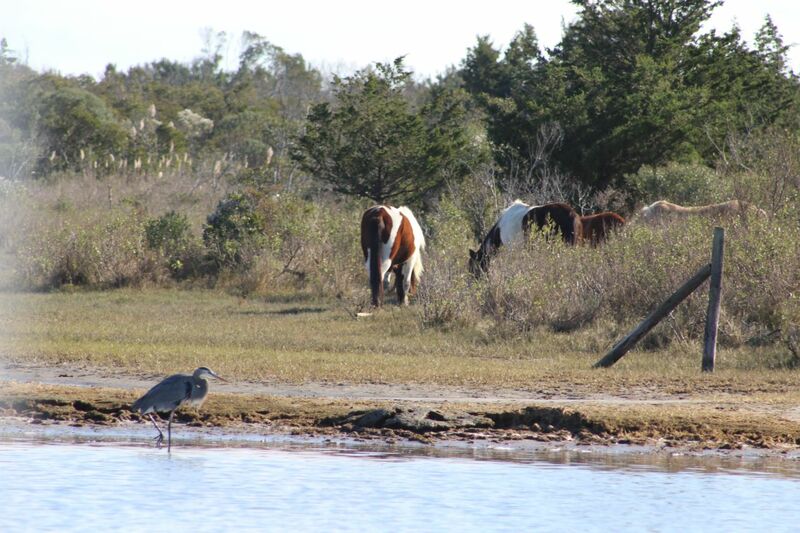 This was the quintessential image of Assateague wildlife: the ponies and a heron in frame at the same time. 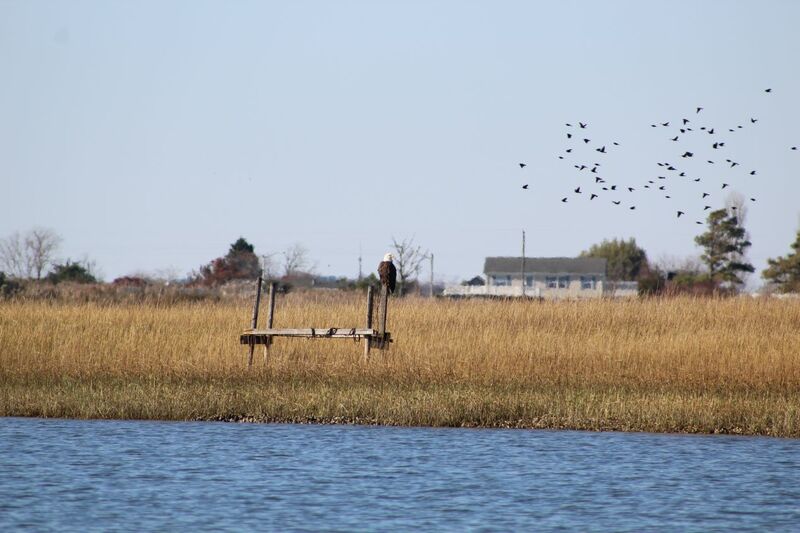 Not to be outdone, we also spotted a bald eagle on our return trip back to the marina. 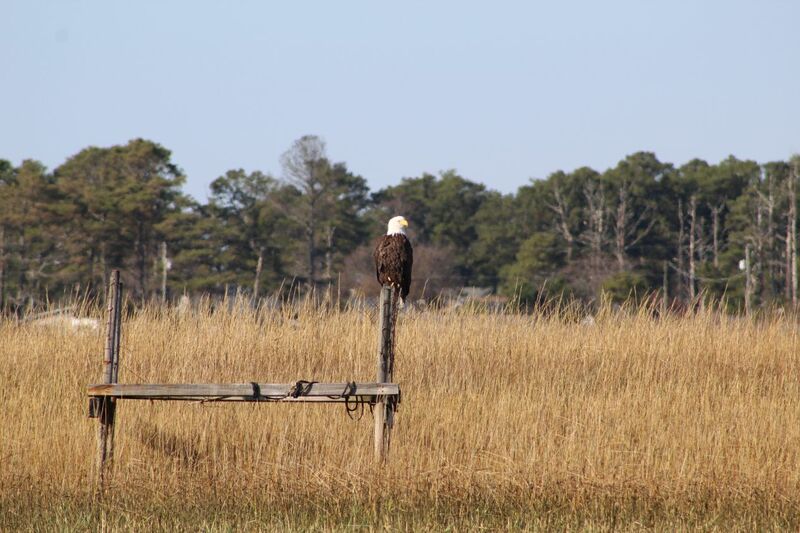 Bald eagles can be found almost anywhere in the continental United States these days, after nearly dying out as a species in the 1960s, and we had seen another bald eagle the previous year on another boat trip in the Chesapeake Bay. They are beautiful birds with highly distinctive plumage, the white feathers on the head and neck standing out from the dark brown feathers on the rest of the body. They're also pretty enormous as far as flying birds go, with a wingspan of more than two meters (6-7 feet) in size. It's easy to see why eagles have been used as a national symbol for everyone from the Romans to the Russians to the Lakota, and why the bald eagle was chosen as the national bird of the United States. This particular eagle was chilling on top of an old dock post, looking for an opportunity to catch more fish. That was the end of our boat trip; we spent the rest of the day checking out more of the stores in Chincoteague before getting dinner at one of the best restaurants in town, Bill's Prime Seafood & Steaks. 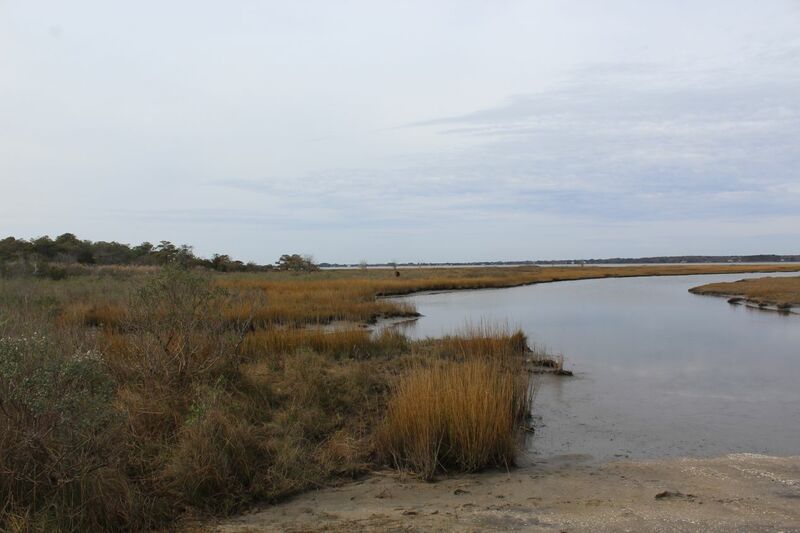 When we left the next morning, we decided to visit Assateague Island National Shoreline. 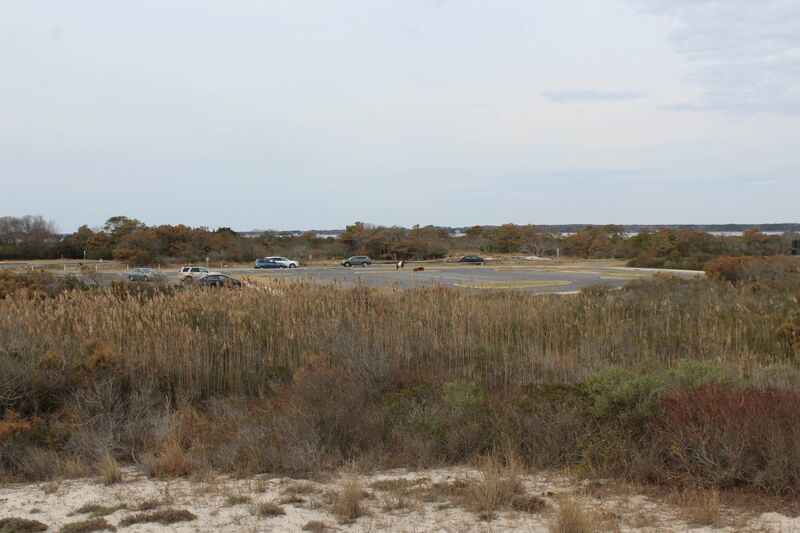 This required taking a highly circuitous route by car, back onto the mainland and up across the Maryland border, as there are no roads that run from one end of Assateague Island to the other side. 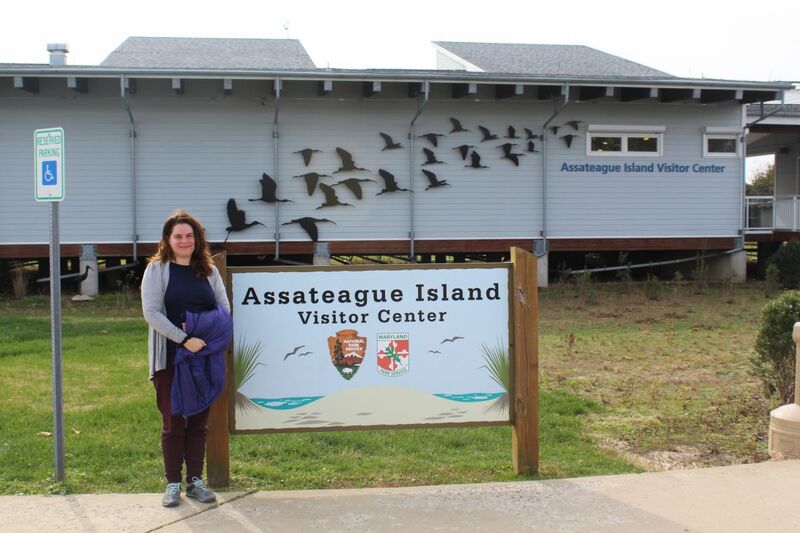 We had previously visited the Virginia part of Assateague at its southern end, and now we were visiting the Maryland part of Assateague at the northern edge of the island. 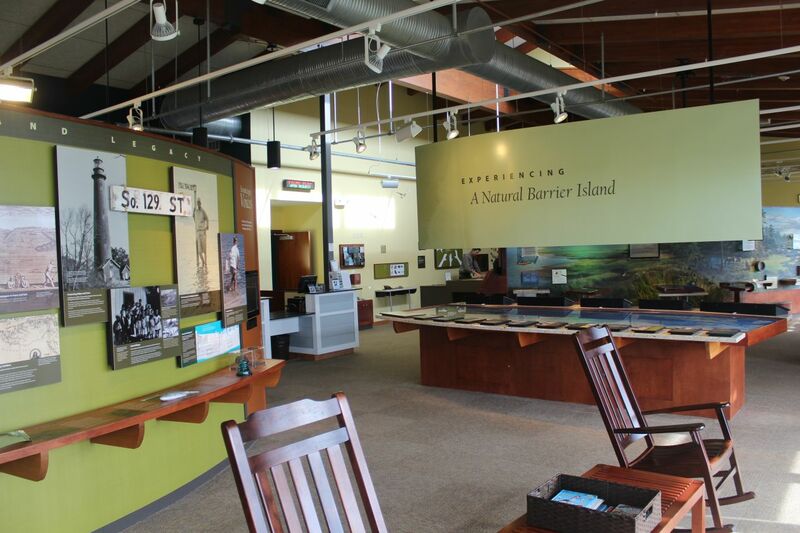 The National Park Service maintains a visitor center here that goes into more detail about the environment of a barrier island, as well as the specific history of Assateague. I learned here that there was a plan at one point in time to open up the whole island to commercial development, a plan that fell apart only because a hurricane that landed in 1962 tore apart the few existing structures at the time. 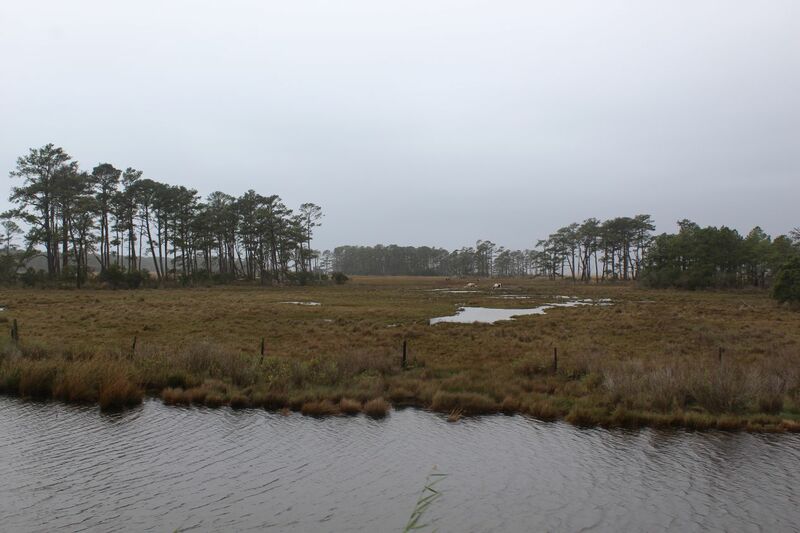 This led to a recognition that Assateague wasn't stable enough to be built upon, and its eventual transformation into a protected wilderness area. 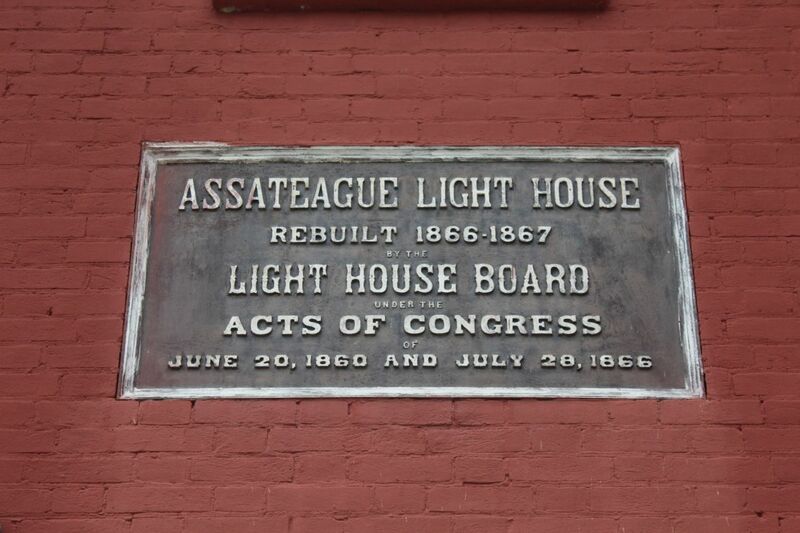 Administration of Assateague is today shared between the federal government and the state governments of Maryland and Virginia. 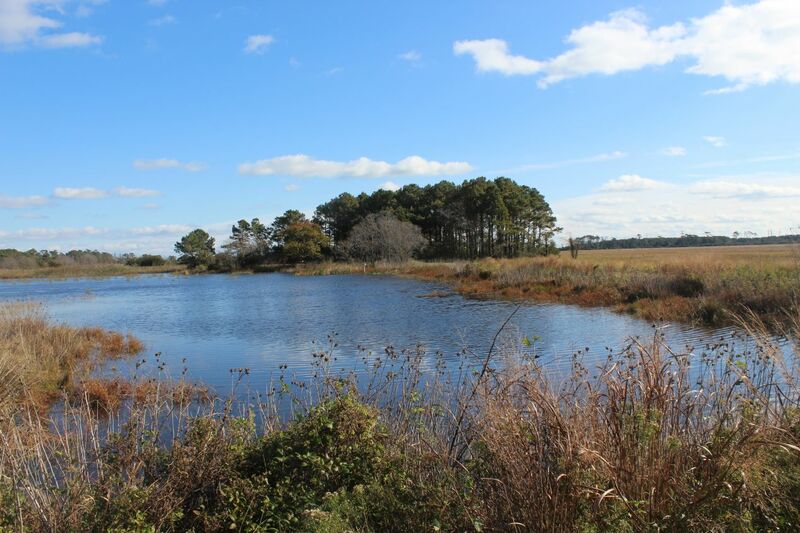 The northern end of Assateague contains several campgrounds along with hiking trails and places for swimming and fishing. There wasn't a great deal of activity taking place when we visited in November, only a few hardy souls camping out for the weekend. 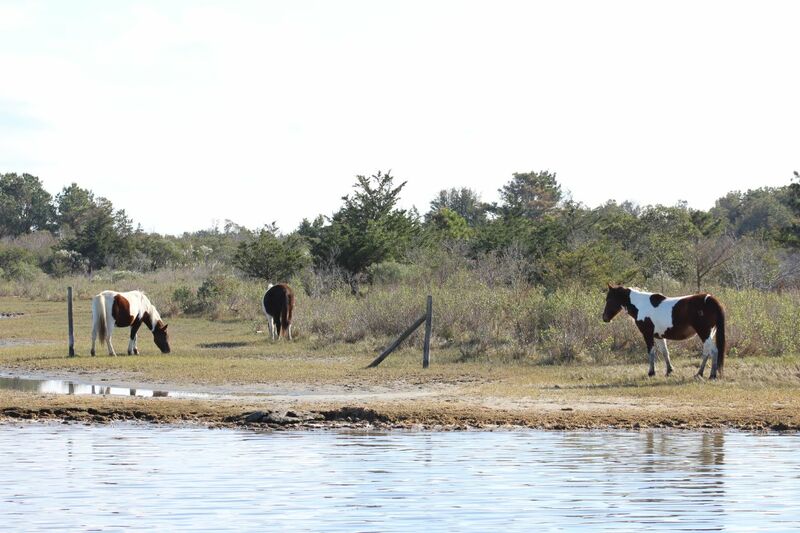 This is still Assateague though, and the wild ponies will roam up through the campgrounds whenever they feel like it. 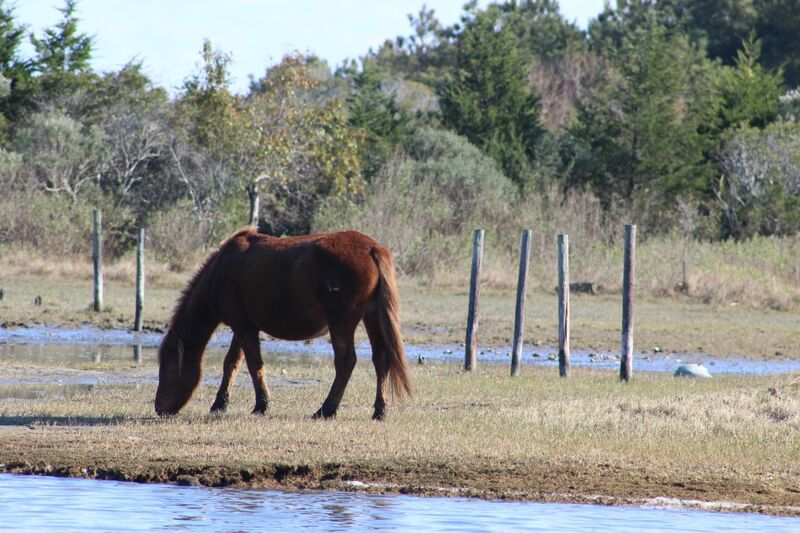 We spotted one solitary pony from the road, eating away at the marsh grasses on the bayside western part of the island. This was the only isolated horse that we saw on our trip and it was therefore likely a young male. 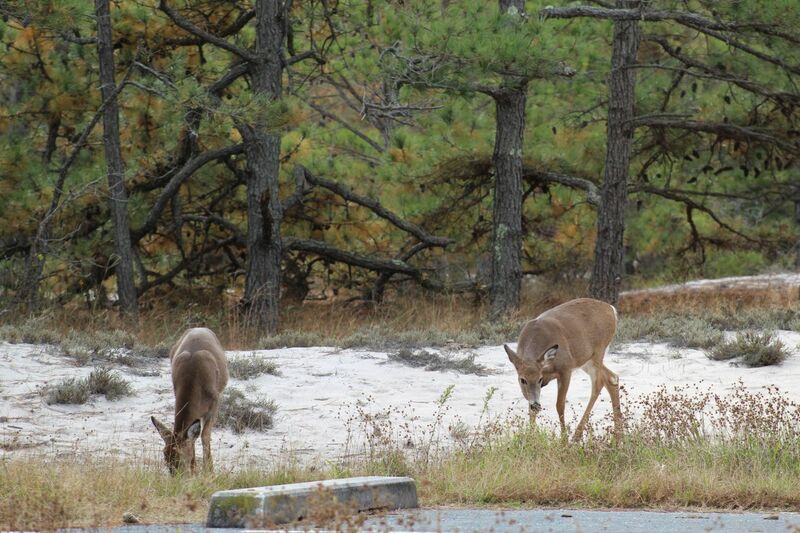 There are deer that live on Assateague as well, and we came across a pair of them near the parking lot of one of the campsites. 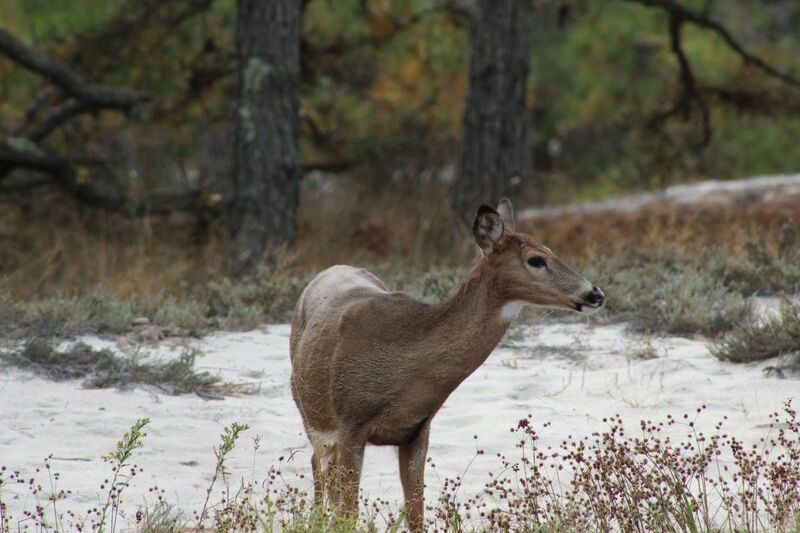 Just as the ponies are small in comparison to other horses, these deer were also quite tiny in size due to the climate of Assateague. They didn't seem phased by our car and we were able to get close enough to get some nice pictures. 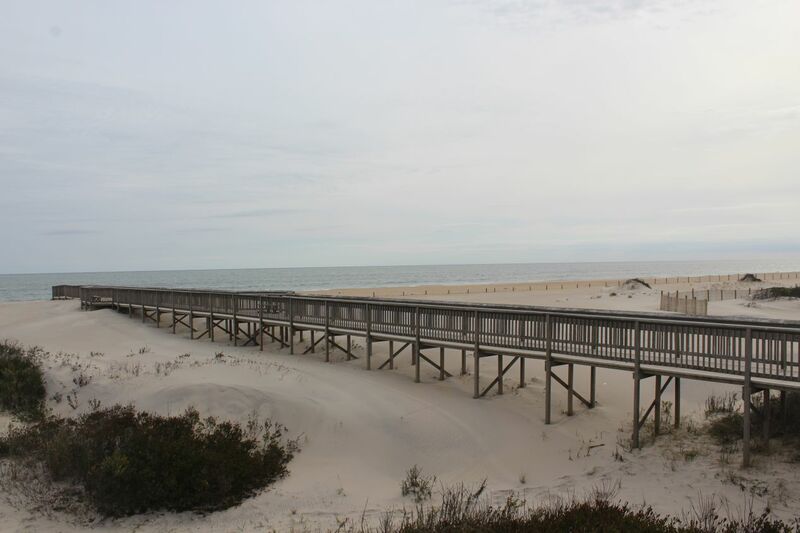 The beach itself wasn't far away, accessible via a wooden walkway that led out to the dunes. 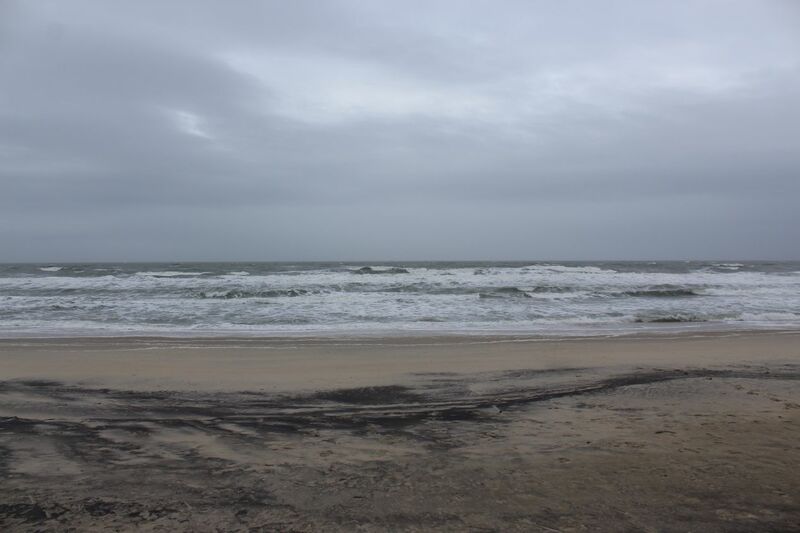 This was an environment that I was familiar with, as the beach on Assateague looked exactly like the beaches where I had grown up swimming in nearby Ocean City. Low dunes of sand predominated, with tough scrub bushes popping up far enough back from the coastline that they wouldn't get inundated with salt water at high tide. 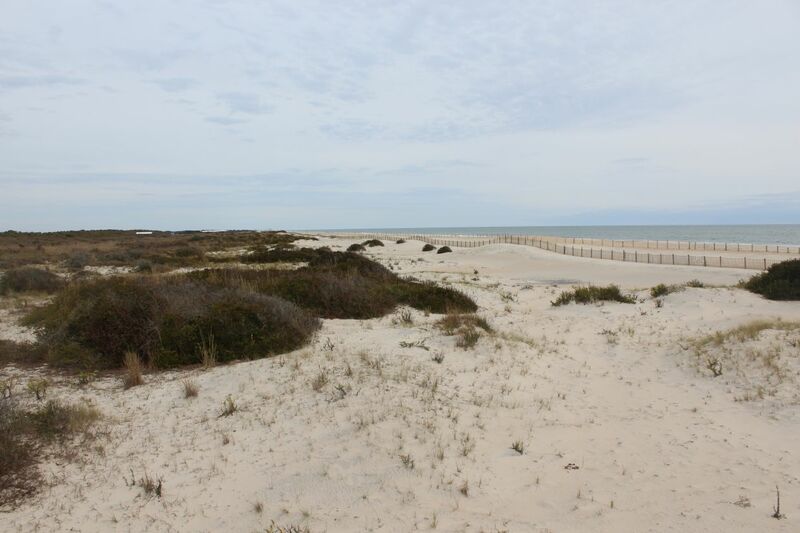 Assateague has campsites located right on the seashore, a stone's throw away from the ocean. This place would have been packed with people in the summer, as the campsites always fill up during the tourist season and have to be reserved in advance. By contrast, we basically had the place to ourselves in November. Finally, we encountered these two ponies in one of the empty parking lots next to the beach. Why they decided that this was the best place to lay down and get some rest, I have no idea. There was a strange juxtaposition here of wilderness and curated space, a completely ordinary parking lot that nevertheless had a pair of wild horses roaming it through it. 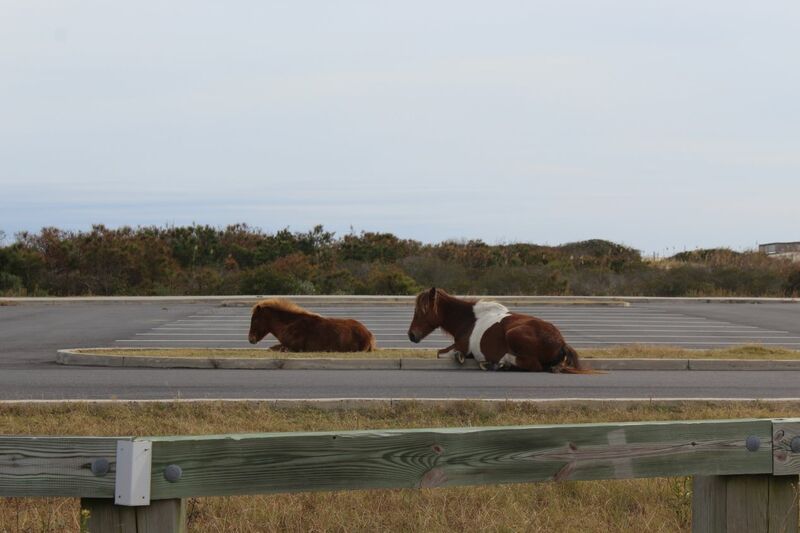 It's important to keep in mind that the ponies on Assateague are genuinely wild animals; while they are indeed cute creatures, they are not domesticated and do need to be treated with some caution. One of the ponies was sleeping standing up, while the other one (a foal?) had laid down in the grassy median of the parking lot to catch some rest. We took a bunch of pictures and otherwise gave them a respectable distance. Liz and I had a great time overall on this trip. It can be a lot of fun to visit a seaside town when it's out of season, without being subject to the traffic and the noise and the crowds of the summer months. All of the best restaurants in Chincoteague remained open and it was pretty nice that we could get meals without needing to worry about long lines. 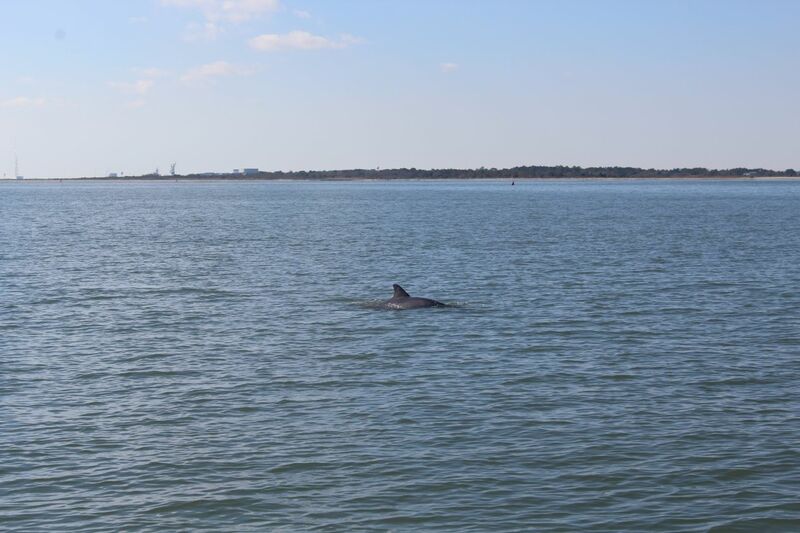 We were fortunate to see all kinds of wildlife over our three days in the area, starting with the wild ponies but also including deer, blue herons, the bald eagle, and even a dolphin. We would both like to come back again at some point, and in particular to see the Pony Swim even knowing what a madhouse it must be. Chincoteague draws 50,000 visitors to a town of 3,000 residents for the annual event and it has to be pretty crazy. In the meantime, we have some great memories from this weekend excursion and I was able to check off a visit to a place that I had somehow missed seeing up to that point. All in all, not a bad holiday weekend.